Kataragama, Kacharagama or Kadiragama...whatever name you may call it, it's a place of worship for all. People from all religions gather here to pray to the Kataragama Deiyo or God Skanda in the belief that their wishes would be granted. Kataragama has a great history linked with many myths and beliefs. So, we spoke to the Chief Priest of Kataragama Abhinavarama Temple, Saranatissa Thera, to learn about the history of Kataragama. There are a large number of stories which are believed by people as the true history of Kataragama, but these are mainly legends. According to Saranathissa Thera, Kataragama has a history dating back to the time of the Buddha's third visit to Sri Lanka, in the sixth century BC, during the reign of the provincial King Mahasena. The Buddha is said to have visited Kataragama with 500 other arahat Theras. The present Kiri Vehera is said to have been built at the spot where the Buddha had sat. The location had been Mahasena's garden of Kihir trees. The Buddha had given the King a hair relic and the King had built a chetiya at the place, enshrining the relic. Since the chetiya was built in a forest of Kihir trees, it was known as Kihir Vehera. Later, for easy pronunciation, it had been changed to Kiri Vehera. The place where coconuts are dashed. The chetiya built by the Provincial King Mahasena had not been that big; it had later been renovated and expanded to its present size by several other kings including Dutugemunu. It is believed that King Dutugemunu made a vow at the bo tree, to renovate the place and build a devala, before he left to fight the war with Elara. Some of the Kshatriya nobles who accompanied Vijaya to Sri Lanka in 543 BC settled down at Kataragama and ruled the area. These nobles were among those who were invited by King Devanam Piyatissa to grace the occasion of the planting of the sacred bo sapling, which was brought down from Gaya, India by Theri Sangamitta, at Maha Mega Uyana. 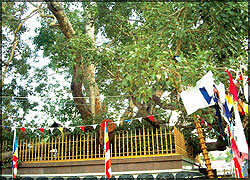 The Bo tree at the Kataragama Devala premises, which is worshipped by Buddhists, is one of the shoots that sprang from the eight fruits yielded by the sacred bo tree at Anuradhapura.  There are two stories about the origin of the Kataragama Devala. One is that King Mahasen, who helped the villagers in a big way, was worshipped as a god after his death. 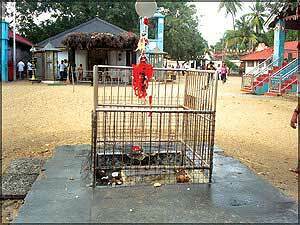 It is said that the Kataragama Devala was dedicated to him by the villagers. The second story says a person who came from India was worshipped as a god by the villagers due to his super-normal qualities. Valli, an indigenous woman, was known to be the wife of Lord Skanda, so it could always be argued that to marry a human woman, Lord Skanda should have been a human being. It is said that the Sinhalese in the village built a devala in honour of him, and that these people who built the devala during the Dutugemunu era became the inherited officials or Kapuralas of the temple. Even now, the Kapuralas continue to inherit that position. 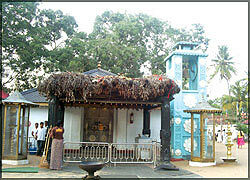 It is said that the Tamils at Kataragama did not worship Kadira Deva at the time. The Hindus worshipping at the shrine later introduced Skanda Kumar, son of Siva or Iswara of the Hindu Pantheon (a god of wars), as the reigning deity of the shrine. Kataragama Deiyo is depicted in human form in an illustration in the front curtain of the shrine at Kataragama Devala; here, he is seen riding on a peacock, his vehicle of transport, and accosted by his two wives. He was once believed to be a real flesh-and-blood person, but became a mythical figure later. Thus, Kataragama Deiyo is believed to be a combination of two spiritual gods - Kadira Deva and Skanda Kumar - and is worshipped as one god. Since the decline of the ancient Sinhala kingdoms on account of non-stop clashes among royalty and the vast destruction and ruin brought about by frequent attacks, especially by the cruel Chola invader Magha, both the Kingdoms of Ruhuna and Anuradhapura ceased to exist. The roads and byways disappeared within a short time. The country was swallowed up by the jungle, which blotted out everything on its path, rendering the areas the abode of wild animals. Sinhalese kings confined themselves to rule from Dambadeniya, Yapahuwa, Kurunegala, Gampola, Kotte and Kandy. The remains of the ruined cities of Anuradhapura and Ruhuna were gradually covered by the jungle and remained hidden from human view for over four centuries. It was the last of the foreign conquerors, the British, that directed their interest towards preserving the remaining traces of Sinhalese civilization. The wild jungles of Ruhuna had by then almost approached the precincts (limited areas) of the Tissa Dagoba built by King Kavantissa. During the dark era of Kataragama, the existence of the ancient shrine was known only to a few villagers who lived there amidst great difficulty. They continued to worship at the shrine, holding on to the faith (on God Kataragama) of their ancestors. Pilgrims of the day had to walk to the shrine as there were no proper roads. Some Catholics and Christians are also attracted to Kataragama by the pooja performed at the shrine. Milkrice is offered to God Kataragama at the shrine by Buddhist and Hindu devotees; they also take holy water in their cupped hands and drink it with bowed heads in utmost respect, very much like at a Catholic Mass. However, these rituals and practices had been conducted long before Christianity was introduced to Sri Lanka. Muslims too have their own mosque at Kataragama, where they perform religious rites, at the grave of a Muslim dignitary, Saul Palkudi Bawa. Millions worship at this multi-religious shrine, irrespective of their religious beliefs. At this Devale, there are no arches or figures of gods and idols seen in Hindu temples elsewhere. The Holiest of Holies, or Maligawa as it is called, is hidden by a curtain, and contains a representation of God Kataragama. No one is allowed to go into the Maligawa except the chief Kapurala. He has taken an oath not to reveal a word about what happens inside. It is believed that it is not right to talk about it. 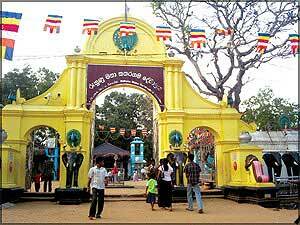 Kataragama is an attraction for all time. With the march of time and with modern road constructions, the place is now urbanised. Hotels, guest houses, pilgrims' rests and commercial buildings have invaded upon the boundary of the Menik Ganga, which flows close to the Devale. The river flows placidly and is shaded by giant Kumbuk trees as old as time, on either bank. The Menik Ganga is venerated by the Hindus as well as Buddhists. Earlier, there was only a suspension bridge across the river. Now this has been replaced by a narrow concrete bridge, which is not meant for vehicular traffic. 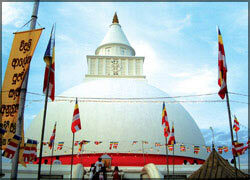 According to Saranathissa Thera, the Kataragama Devala premises are a blessed place. Those who have faith in the god will have their wishes come true.